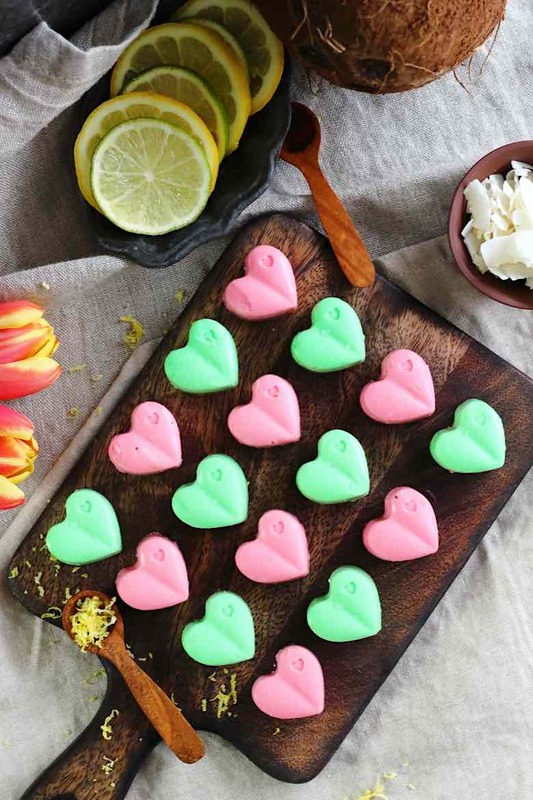 Home Tags Posts tagged with "#valentines #fatbomb #lowcarb"
Keto Fat Bomb Cream Cheese Recipe Low Carb is a perfect addition to the LCHF way of eating. Those deliciously smooth, rich and flavorful tasty Fat Bombs are a must if you need to up your fat intake or have a sweet craving in our lifestyle. This post is an update from the original February 2017. At that time I have made it just before Valentines as a perfect Valentines surprise for my family and therefore the colors. But you can experiment with your own shapes or colors, or just let it be plain white for an easy mix. And since we are by Valentines, at the same time you can have a look at the suggestion of making a perfect Valentines dinner with our lovely Easy Cheesy Low Carb Brussels Sprouts Gratin baked in a heart-shaped baking dish for a perfect Valentines Evening dinner. Low Carb lifestyle and Ketogenic diet are very close to each other and most of the time one compliments one another. Difference between those two is, that Low Carb lifestyle is a little bit lighter or less strict way of looking at cutting your carbs or adding the amount of Fat. A ketogenic diet is where one tries to get the carbohydrates into a complete minimum and instead tries to get as much fat as possible into the system. In that way, the body slowly transforms into Ketosis and starts burning fat instead of carbohydrates for the energy it needs. That happens, when our body has got a lack of glucose and starts producing small molecules called ketones. There are different reason people are following a Ketogenic diet. Some follow the diet because of various health reasons. One of the proven examples following the Ketogenic Diet is with a great reduction of seizures in kids and adults suffering from Epilepsy. Majority of people follow the Ketogenic diet for weight management. The Internet offers various sources, where the Macro-nutrients are calculated and suggests exactly how much of the Calories, Carbs, Protein and Fats you should consume. Some people follow those Macro-nutrients calculations and try to follow the numbers as much as possible. 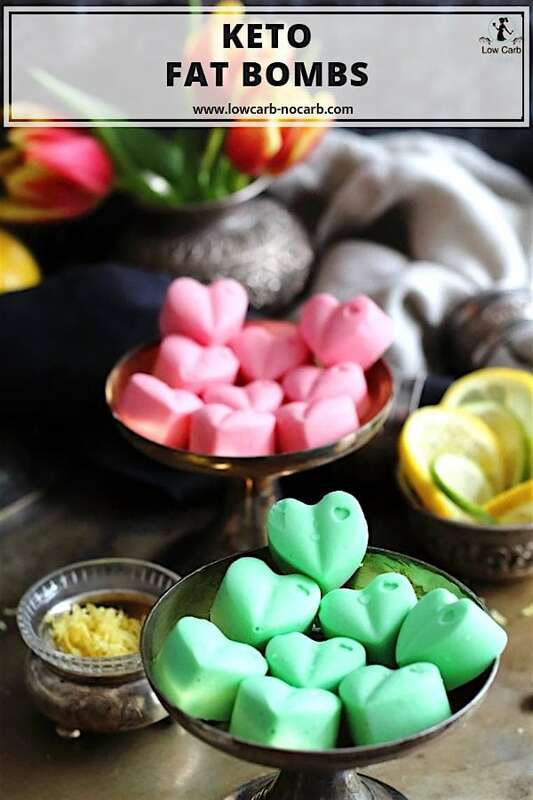 And there come to the option for Fat bombs. Most of the time, it is very easy to get the amount of Protein and carbs into your body, since the Macro-nutrients are calculated in a way, where the majority of the percentages are Fat. 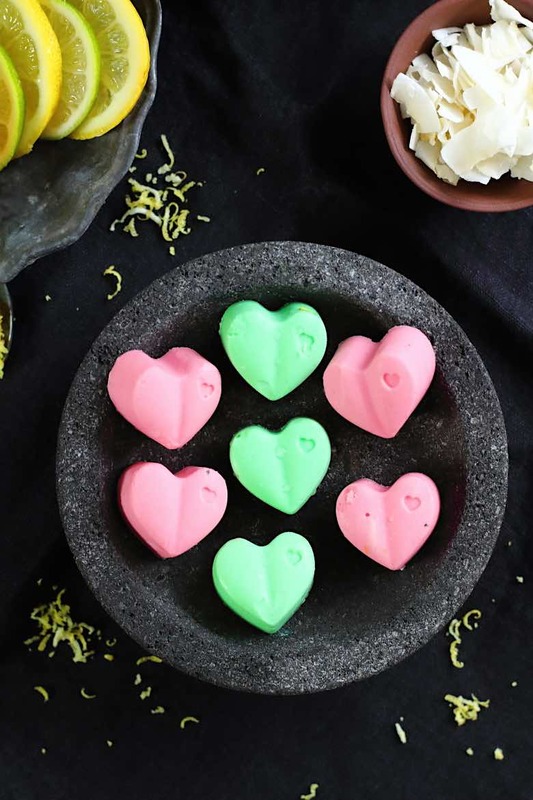 And as most people really struggle with ways to add that fat without just taking scoops of butter or coconut oil into you, which is not tasty at all, Fat Bombs has been implemented. In our family, because of our daughters Diabetes, we follow Low Carb lifestyle as per Dr. Bernstein, where we do try and add as much protein as possible, for her growth. We do not add extra fat or follow the amount of fat we have. 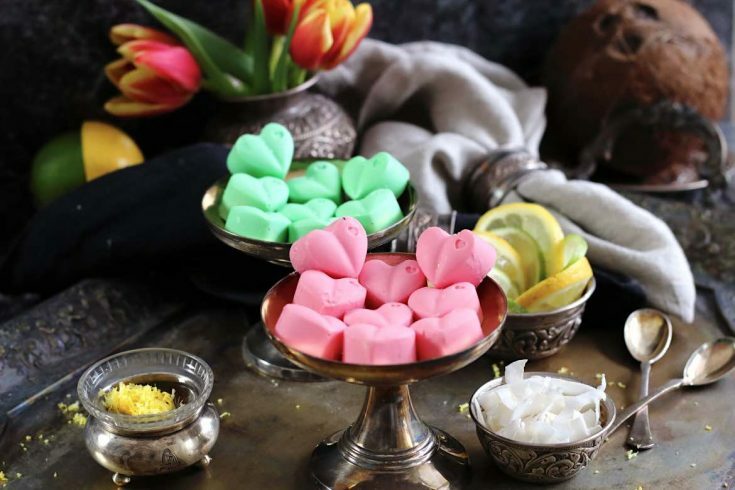 Fat Bombs are small shaped snacks, most of the time on a sweet side, which are filled with as much fat as possible and therefore gives you enough fat, you so struggle to get as per your Macros. They help you to feel full for a longer time period with just a small piece. There are various names used like Fat bombs, Keto Bombs, Fudge, which are at the end all the same thing. Are Keto Fat Bombs good for you? Since they are containing mostly all of the healthy fats like Coconut oil, butter or any nut butter, yes, they are extremely healthy, but like all, eaten with caution. They also do not contain any refined sugar or carbohydrates, which is added advantage. But since they are really filling, I do believe, you would not even be able to eat too many of them. 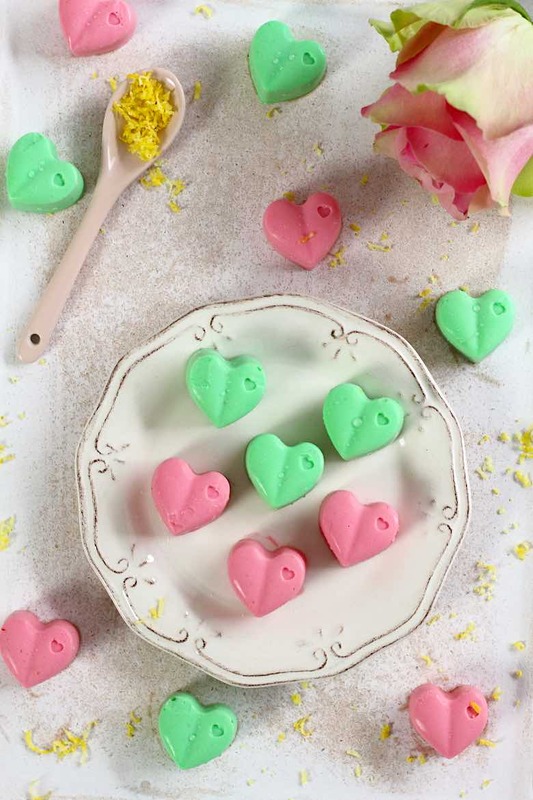 They are also perfect if you do have a sweet tooth and need something tiny and sweet to have. In that case, I have few pieces in my freezer and just take one and all of the cravings is gone. 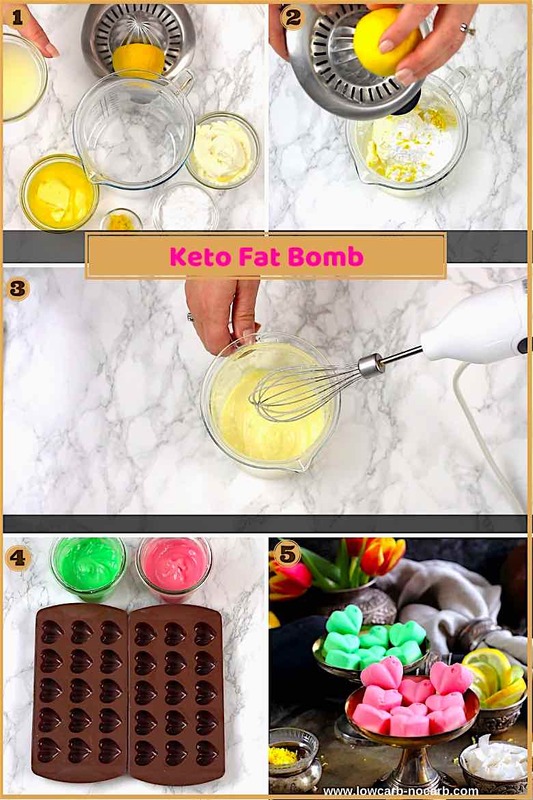 How to make Keto Fat Bomb? Main ingredients are Fat – Sweetener – flavor. They all are No bake and very easy to do. Also, you can do your own experiment and just add different types of flavors, oils or sweeteners to make it unique. All you have to do, is mix your preferred ingredients, give them a shape and you have it. How to make Cream Cheese Fat bomb? 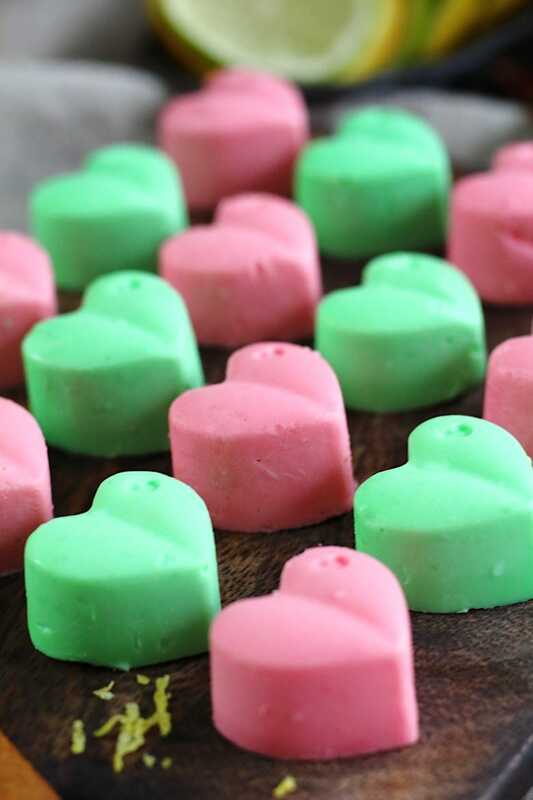 Adding Cream cheese into fat bombs, give you the taste of a cheesecake, which we all so adore. Also, the taste of oil or fat is tiny bit diminished and therefore does not taste too heavy. Can you add Keto Fat Bomb into your coffee? O yes. You can, and you will be surprised with a wonderful coffee taste you will receive. You can use it in exchange for Starbucks coffee and also if you are a fun of Bulletproof coffee, which is very popular everywhere and I am sure you have already tried it at least once. How to store Keto Fat Bomb? Once they are placed into your preferred mold containers, place them into the freezer for the shapes to freeze. In that way, it is much easier to handle them afterward. Once frozen properly, take them out of the molds and store them in an airtight plastic container, or a sealable bag, which will take much less space in the freezer as the whole molds altogether. Afterward, you can either keep them in the fridge or a freezer. We have them always in the freezer, because of longer shelf life and as well, since they are mostly tiny pieces, it takes less than a few minutes for them to melt into perfection. Can you freeze Keto Fat Bombs? As already mentioned above, yes, they are perfect to freeze and also keep in the freezer for up to a year. What types of Keto Fat Bombs exists? 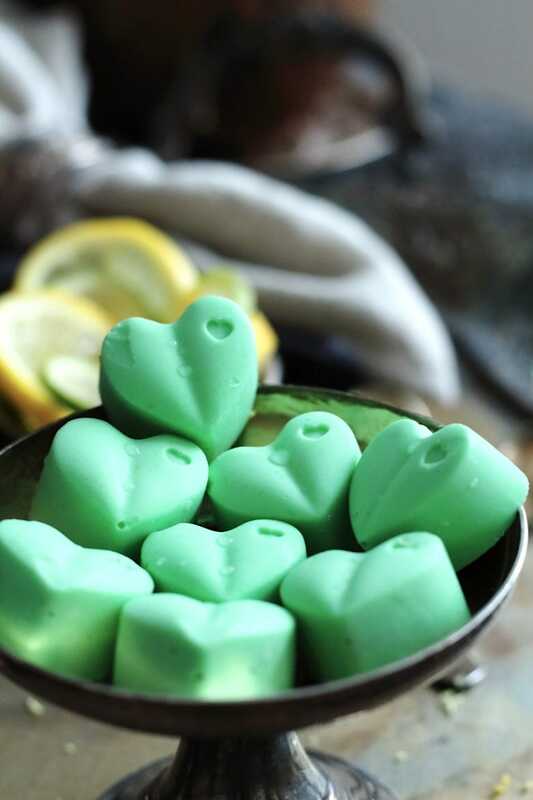 What Molds to use for making Fat Bombs? I even made it once in the Gummy Bears silicon trays, where our Sugar – Free Gummy Bears are being born on a regular basis. You can also just simply fill up your icing bag and pipe in on a tray, which is then placed into the freezer for the shapes to take place. All you have to do once the Fat Bombs are frozen is, to place them into a airtight container and back to the freezer. In that way, you always have a piece you can take out. Anytime you do crave something sweet or you do need to fill up your fat intake because of your Macros. Try to have all of the ingredients in a room temperature, so once they are mixed together, one ingredient melts into another. Otherwise, they might become curdled and the taste is not very pleasant. What if the mixture really curdles? Sometimes with adding either different temperature of ingredients or just by adding lemon into it, it is possible that the whole mixture gets curdled. But no worry. All you have to do is, place it in the microwave for a few seconds and then mix it properly again. That way, all of the ingredients get nicely combined into one smooth, rich and flavorful batter. And now to our Recipe. Take it from the freezer, out of the molds and keep it in the Zip-lock bag in the freezer so they do not melt. Do not forget to subscribe to our newsletter here to get all the new recipes right into your mailbox.